Hello, my name is Jenna. 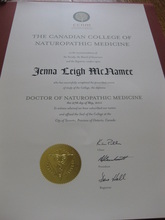 I have been a Naturopathic Doctor since 2011, when I graduated first in my class of 120 students from the rigorous four-year Doctor of Naturopathic Medicine Program at the Canadian College of Naturopathic Medicine (CCNM) (one of only seven schools accredited by the Council on Naturopathic Medical Education [CNME]) . 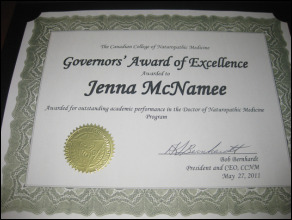 I received the Governor's Award of Excellence upon graduation for my academic achievements. 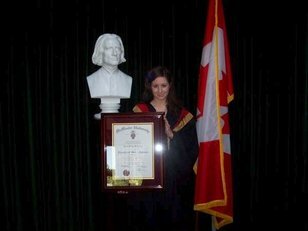 After graduation, I successfully completed the week-long Naturopathic Physician Licensing Examinations (NPLEX) administered by the North American Board of Naturopathic Examiners (NABNE) as well as the Ontario Clinical and Jurisprudence Examinations administered by the College of Naturopaths of Ontario (CONO). These steps are all required in order to demonstrate to the College of Naturopaths of Ontario (the regulatory body for Naturopathic Doctors in Ontario) that I meet all of the entry-to-practice requirements. I received my certificate of registration and license to practice Naturopathic Medicine in Ontario in 2011 and have been practicing ever since! Throughout my four years at the Canadian College of Naturopathic Medicine, I received in-depth training in the medical sciences, diagnosis, physical examinations, and naturopathic modalities including: Clinical Nutrition, Botanical Medicine, Homeopathy, Physical Medicine, Counselling, Acupuncture, and Traditional Chinese Medicine. During my final year, I saw patients on a full-time basis at the Robert Schad Naturopathic Clinic. Additionally, I completed a clinical rotation with Dr. Arvin Jenab, ND, at the Queen West Community Health Centre, which caters to the residents of the Queen West neighbourhood of Toronto who require naturopathic services. During my formative years at CCNM, I was privileged to have the opportunity to observe many Naturopathic Doctors in clinical practice, including Dr. Sandra Miranda, BSc, ND, and Dr. Joseph Kellerstein, DC, ND, FCAH, CCH. I also had the privilege of working closely with Dr. Danny Wu, CMD, Dr. AC, PhD for an extended period of time, expanding my knowledge in traditional Chinese Medicine and Acupuncture. I completed my four-year undergraduate degree at McMaster University in the Bachelor of Health Sciences Program, the only one of its kind in Ontario, which draws upon a full range of clinical departments. 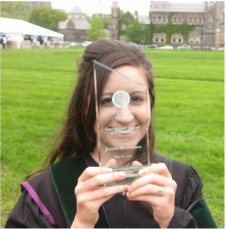 I maintained my position on the Dean's Honour List throughout my time there and received the McMaster President's Award upon entry to the program. I had the privilege of working with Dr. Arya M. Sharma MD/PhD, FRCPC, Professor of Medicine and Canada Research Chair for Cardiovascular Obesity Research and Management in my last two years and was the runner-up in the Canadian Obesity Network Thesis Competition in 2007. I was also a member of the Medicine & Health Society and was invited to join the prestigious Golden Key Honour Society - McMaster Branch during my time at the university. In addition to my education, I have volunteered for many years at both Lakeridge Health Oshawa and the McMaster University Medical Centre in many different clinical departments. My time volunteering allowed me to spend a lot of time with patients and their families, and I gained a lot of insight from them. From 2011 to spring of 2014, I practiced Naturopathic Medicine out of a Chiropractic Clinic in Oshawa. I was thrilled to be able to return to my roots after being away to complete my eight years of post-secondary education. In 2014, I was presented with an opportunity that I could not refuse - I was able to open up my very own Naturopathic Clinic! 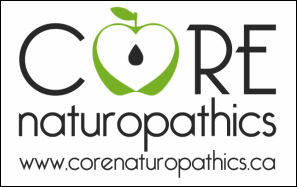 Core Naturopathics opened its doors in Whitby on May 2nd 2014 and has been serving the residents of the Durham Region ever since. I continue to look forward to giving back to my community and serving the residents of my hometown and surrounding area. In 2017, I was extremely fortunate to be able to team up with my partner, Dr. Brian Casteels, ND, when we merged our clinics together under the Core Naturopathics umbrella. Partnering together in both our personal and professional lives has been very rewarding, and we feel that our partnership further enhances our clinic as well as the care that we are able to provide. We strive to constantly be learning, analyzing, and updating to keep our clinics and practices fresh, up-to-date, and vital - all keys in being the best NDs we can be! Over the years I have done additional training in women's health, fertility, pregnancy, post-partum, hair tissue mineral analysis, nutritional balancing at the cellular level, metabolism and weight loss, and ancient Asian healing & medicine, as well as keeping up to date with the vast amount of new research that is continually being produced in both the medical and naturopathic fields. Although I have a general family practice and see patients from a wide range of demographics with a variety of health concerns, I have a special interest in pregnancy, fertility, digestive, hormonal, and metabolic conditions. I also strongly utilize diet, lifestyle, clinical nutrition, herbal, and Chinese medicine in my practice as they are most often foundational to any successful treatment plan. I work with clients who eat all kinds of diets and will use many different diets therapeutically. I love and am extremely passionate about natural medicine, health, and healing. If you were to be a fly on the wall observing my daily life, when I'm not with my daughter, you'd most likely find my eyes glued to a natural health book or journal article for hours (and hours and hours and hours) - my family and friends can attest to this! I seriously cannot get enough of this stuff (it's kind of an obsession!) and I will go above and beyond for you in any way I possibly can. I so very much enjoy constantly researching and learning new things, which greatly enhances my practice and my knowledge that I am able to bring to you and apply to your unique health concerns. Additionally, nothing brings me greater joy than using all of this information to help my patients feel their best - what an honour to be able to have such a great and profound impact on my patients' lives! I take great pride in my practice and in my work (if you can even call it work - being a health detective is so much fun!) and am thrilled to be able to provide all of my patients with exceptional care. I look forward to helping you in health.